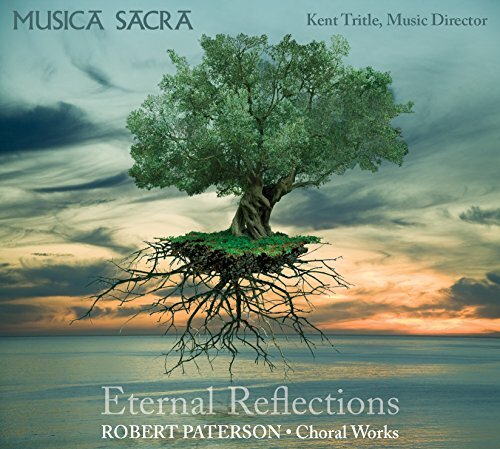 Eternal Reflections is a collaboration between Musica Sacra, one of America's greatest professional choirs, Music Director Kent Tritle, and award-winning composer Robert Paterson. This is the first album dedicated entirely to Paterson's choral music, and all works on the album are world-premiere recordings. This beautiful album was recorded at the world-famous Academy of Arts and Letters in New York City, and produced by multi-Grammy winning producer Adam Abeshouse. The works on the album include everything from secular to sacred works, from serious to lighthearted and even humorous. Lux Aeterna, written specifically for Musica Sacra and Kent Tritle, is a setting of excerpts of text from the Requiem Mass. Eternal Reflections was originally commissioned by the Volti Choir of San Francisco and the winning work of the Cincinnati Camerata Composition Competition, and includes settings of texts by Czeslaw Milosz, Mary E. Frye and Paul Lawrence Dunbar. The Essence of Gravity, also commissioned by Volti, is a set of four movements using onomotopeia words as texts. The movements are inspired by aspects of gravity,both physical and emotional, on subjects as diverse as war, love, the ocean and outer space. A Dream within a Dream was commissioned by the Chamber Choir of Europe and is a setting of the text of the same name by Edgar Alan Poe. Life is But A Dream: also commissioned by CCE, is based on Row, Row, Row Your Boat, and incorporates multiple translations of this famous round in different languages. Suite from A New Eaarth (for orchestra, chorus and narrator) was written for the VYOA Choir during a Music Alive! New Music USA residency. This piece touches on environmental issues and global warming; text by Wendell Berry, James Joyce, Percy Bysshe Shelly and William Wordsworth. Did You Hear? addresses the life of teens and the consequences of rumors and gossip, with an original text by David Cote. Snow Day was commissioned by the Pelham Memorial High School Choir, and expresses the joy of having a day off from school; text by David Cote. Musica Sacra was founded by Richard Westenburg at Central Presbyterian Church in 1964; it was the first all-professional, paid admission choral series ever undertaken by a church. By the early seventies, the popularity of its concerts caused it to become independent and move to larger venues, including Carnegie Hall and the Metropolitan Museum of Art. For many years, concerts were given at Lincoln Center, and it was there that Dr. Westenburg founded Musica Sacra’s Basically Bach Festival, and led its main concerts from 1979-89. The Festival was reinstituted in March, 2006. In early 2006, Musica Sacra named Kent Tritle to be its associate conductor and eventual successor to Dr. Westenburg, and Tritle was Dr. Westenburg’s personal choice to take over the reins of Musica Sacra. In addition to its acknowledged affinity for Baroque music, Musica Sacra has performed in all styles, from the chant of Hildegard to commissioned works and first performances of leading contemporary composers, such as Diamond, Britten, Khatchaturian, Convery and Rorem. They have recorded on RCA, BMG and Deutsche Grammophon music ranging from Handel (the first complete all-digital Messiah, in 1981, and still available), to Schoenberg, Bruckner and Meredith Monk. Their most recent album, Messages to Myself, is a collection of outstanding contemporary choral works by a variety of living American composers. For more information, visit musicasacrany.com. Kent Tritle is one of America’s leading choral conductors and the organist of the New York Philharmonic and the American Symphony Orchestra. Called “the brightest star in New York’s choral music world” by The New York Times, he is in his third season as Director of Cathedral Music and Organist at the Cathedral of St. John the Divine in New York City; his seventh season as Music Director of Musica Sacra, the longest continuously performing professional chorus in New York, and his ninth season as Music Director of the Oratorio Society of New York, the acclaimed 200-voice volunteer chorus. In addition, Tritle is host of the weekly New York radio show The Choral Mix with Kent Tritle on WQXR. He has been a member of the graduate faculty of the Juilliard School since 1996 and also established Manhattan School of Music’s first doctoral program in choral conducting. Kent Tritle holds graduate and undergraduate degrees from the Juilliard School in organ performance and choral conducting. For more information, visit kenttritle.com. Robert Paterson was named Composer of The Year at Carnegie Hall by the Classical Recording Foundation. Works from The Book of Goddesses, Duo Scorpio, Wood and Forest, and Six Mallet Marimba have all been on the Grammy® nomination ballot for Best Contemporary Classical Album. The New York Times states, “There’s Schumannian drama and melancholy in the song cycle CAPTCHA that opens this beautiful, witty and sometimes utterly desolate collection of vocal works by Robert Paterson, and it’s all in the music.” “Robert Paterson’s terrific recent recording, Winter Songs, made for one of the best releases of 2013. His small ensemble orchestrations are colorful and clear, and he values lyricism and beauty. CAPTCHA is utterly brilliant... it needs to be a standard choice in the repertoire” (Sequenza 21). His works have been played by the Louisville Orchestra, Minnesota Orchestra, Albany Symphony and the American Composers Orchestra. Upcoming engagements include his opera Safe Word with Fort Worth Opera’s Frontiers Showcase, Dark Mountains with the Austin Symphony and Hell's Kitchen for the Utah Arts Festival. Paterson resides in New York City with his wife, Victoria, and their son, Dylan. For more information, visit robertpaterson.com. Robert Paterson could probably set a telephone book to music and create something that captivates. Luckily, he chooses much better texts, as can be heard on this beguiling disc of the American composer’s choral music performed by Musica Sacra, the New York-based chorus. The settings range from serious rumination on life, death, religion, war and nature to lighter exploring dreams and teenage attitudes. Eternal Reflections, which gives the disc its title, reveals Paterson’s ability to treat words with utmost clarity and send them soaring or engaging in deft choral conversation. The writing is tonal but never predictably so, with subtle touches of dissonance to colour the atmospheres and emotions. Paterson evokes the motion of sea and aura of nature in the Choral Suite from A New Eaarth, four movements of affecting and beautiful sonic layers, and the only work on the disc with piano accompaniment. Elsewhere, Paterson embraces word-painting (sounds of guns and machines in The Essence of Gravity); depicts the bright, conflicted chatter of teenagers (to David Cote’s text in Snow Day and the rumor-laden Did You Hear? ); tweaks a beloved nursery rhyme (Life is But a Dream); and transforms a Poe poem to rapturous effect (A Dream Within A Dream).